This is Chain-Chomp from the Mario Brothers games. I made this because my middle daughter begged me to. LOL. When writing out the pattern for it, I tried to make it as plain as possible, but I'm still learning how to write out patterns for someone other than myself to read, so bear with me. If anything is confusing, please let me know and I'll do my best to explain or change it. If the cube portion of the pattern just isn't working for you, you can always make a cube by crocheting 6 squares that are 3 to 4 inches in size and sew them together to form a cube. I just like the look of the one piece cube better, but either is just fine. This pattern requires a little more advanced work than most of the patterns I have to date. Some of the pieces require more manipulation to fit and the general stuffing process is different. 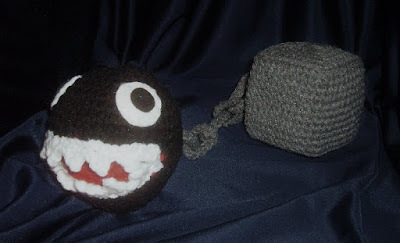 With patience though, even beginning crocheters should be able to make Chain-Chomp. I'll do my best to explain the steps as clearly and as simply as I can. Gauge isn't really important, but your hook, yarn and natural tension should combine to create a moderately tight stitch. I tried using continuous rounds on this pattern, but it just doesn't work out as well due to it's nature. The cube *can* be worked in continuous rounds, but I found that the cube tended to become lopsided in places because of the need for it to be even on all sides. I recommend joining rounds on this pattern, but if you're more comfortable using continuous rounds, by all means do so. Numbers in ( ) at the end of each round/row indicate the total number of stitches that should be in each round/row. Sew the two half domes together for 18 stitches, leaving the remainder of stitches unworked. This should give you a *pac-man* looking shape with a gaping 'mouth'. Set aside for now. Fold this piece in half, and insert into the 'mouth' of the body. Lining up the stitches, sew the mouth to the body with the 'fold' to the inside. Stuff carefully as you go, making sure that you stuff enough to round out the body, but not to overstuff, so that the mouth still remains 'folded' and inside the body of the chomp. This may require some 'easing' of the mouth piece into the body pieces. In the end, you should have a toothless 'ball with a mouth'. Sew the 'teeth strips' to the opening of the mouth as shown in the picture. Pin them first, to help decide exact placement. A little easing of the strips my be necessary to fit them. Repeat for next link, before closing insert through last link (creating the 'chain') then sew closed and make next link. Make the chain as long or as short as you like. Cube is worked in one piece. It's a little different than working a ball in rounds, the increases and decreases are different, but similar enough that it should be possible even for beginners with a little patience. I recommend joining your rounds, but if you are comfortable enough using continuous rounds, it's worth a try. You probably will need to begin stuffing cube at this point (if you haven't already), and continue as you progress. Take care to stuff so that the shape of a cube is retained with minimum bulging of the sides (some bulging is natural) See the picture for references. Rnd 23: c1 Dec3 over next 3 sc around join with sl st to first sc of round (4). F/O leaving tail for finishing off. Using the blunt end of crochet hook, chopstick or eraser end of pencil, add any stuffing necessary to finish out cube shape. With yarn needle, weave the tail through the last 4 stitches of final round and pull to tighten. Tie off. Weave in end. Attach chain to back of chomp and to one side of cube. With white felt, cut two circles and with black felt cut two smaller circles. (on mine, I used a quarter for the white circles and a dime for the black ones, your circles may need to be larger or smaller, depending on your tension and yarn used, but those sizes are a good starting point) Sew the black circles to the center of the white ones as shown in the picture and then to the face of chomp. This crochet pattern is an original pattern by Linda Potts (April 2009). Please do not claim this pattern as your own. If you wish to share this pattern, you may link to this pattern but please do not reprint it on your site. You may keep a copy for your own personal use but you may not sell or distribute it, or sell items made from this pattern. OH my goodness this is awesome!! Great job! I'm supposed to make a Giraffy from the game Castle Crashers and he's pretty much a cube. I've been wondering how on earth to pull that off. Thanks so much for sharing you r awesome patterns! I just made a chain chomp for my youngest son. Check it out on my blog if you like:http://thekansashooker.blogspot.com/2009/05/wolfdreamer-off-hook-has-really-cool.html. Thanks again! This is awesome. I'm making this for my brother. I would like to know how big it is. Thanks for the pattern. Your patterns are just great! I have made the Mario for one son and am now on to making chain-chomp for another son. However, I'm stuck on the instructions for the teeth. The second half of the instructions in the () say to "dc together in the next ch." I think I'm not doing something right. I have just been sk 2chs, sl st, ch 3, and then dc in next ch. But my teeth don't look like your teeth in the picture. Any help on what I'm doing wrong is greatly appreciated!! It was rather interesting for me to read the post. Thanx for it. I like such themes and everything that is connected to this matter. I would like to read more soon. I made jiggly puff awhile back and it was great. I think this may be a Christmas project for a family gift exchange. I already have all the yarn! why I have not seen this site before?! I was trying to find a new way to do the chain on my daughter's chain chomp (not happy with what I have created) and now I find this beautiful critter. I covet the teeth. Have book marked you in delicious and will be using some of your patterns - thank you so much! 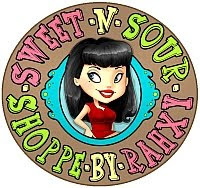 I am in LOVE with your site! My daughter is having a mario brothers/princess peach party in May and I have made the mushrooms (red, the 1 up, and I shifted the pattern slightly to make the smaller blue mushroom), the bombom, and the fire power flower. Your patterns are awesome I just want to thank you for posting them. I'd really love to make a piranha plant, which I assume would be similar to the chain chomp, only the teeth are different. Thank you so much. You are the bombom! Thank you for sharing all the Mario Bros. patterns!!! I am a BIG Mario Bros fan & can't wait to make these. Thank you so much for all your Mario patterns! I'm making most of them for my husbands "man/game cave". I'm a beginner crocheter and your patterns are so easy to follow. I haven't actually assembled one yet, I have the "parts" finished with the colors I have and making a huge craft store haul this weekend so I can finish them up. Really excited and nervous to complete them. All the items I have made turned out perfect and I'm scared that I'll fudge them up when assembling. Hi again! My Mario came out GREAT! I just downloaded Chain-Chomp and Goomba. I will be making another donation to you as I REALLY appreciate these patterns! Tips line #1 - Take your time!